If you love Mickey’s Not-So-Scary Halloween Party, you’ll have one new thing to experience at this year’s event and I have to tell you, I’m super excited for this one. 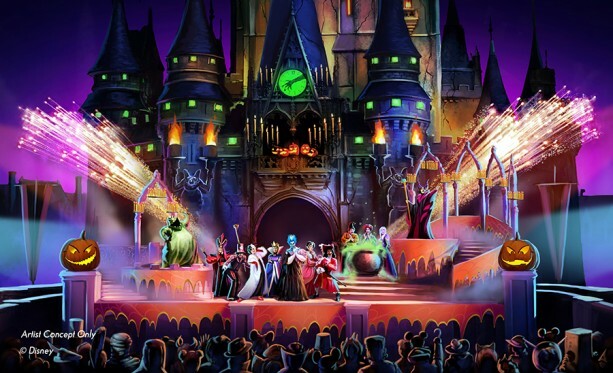 The Hocus Pocus Villain Spelltacular will bring the fantastically evil Sanderson Sisters (from that favorite cult Halloween favorite, Hocus Pocus) to the Castle stage where they will run amuck (amuck, amuck) at this fun party. 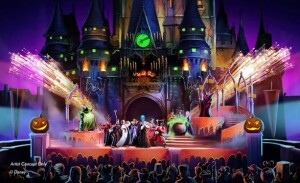 With the help of the Disney villains, the three sisters, Winifred, Mary, and Sarah will conjure the ultimate Hocus Pocus Party Potion and “cast a spell on you.” The show will also feature appearances by Dr. Facilier, Oogie Boogie, Maleficent, as well as other favorite baddies. To round things out there will be dancers, projections, and special effects. The show will be replacing the Villains Mix and Mingle. The whole stage show sounds like a blast. I’ve got my vintage Madonna costume ready because I’m ready for this sisters to perform their magic on me. Mickey’s Not-So-Scary Halloween Party takes place on select nights at the Magic Kingdom, September 15 through November 1. Great news, Rikki! Any idea if this is a once per party show or does it run multiple times through the night? Jim…it should run a few times each evening, much as the Villains Mix and Mingle did previously.